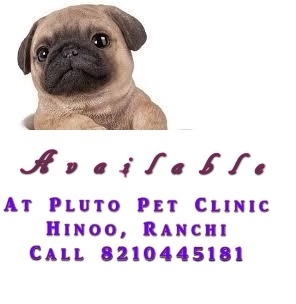 Dog lovers of Ranchi: Do you really want to get a Pug!! Here is one for you in Ranchi! Do you really want to get a Pug!! Here is one for you in Ranchi! 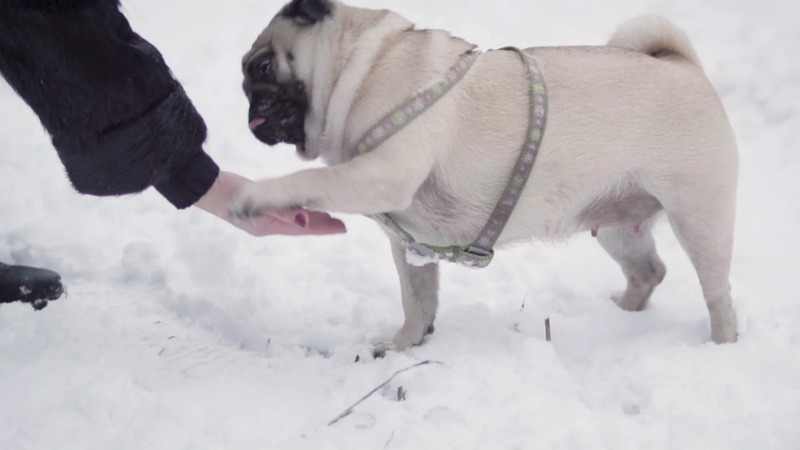 Pugs have some unique characteristics that make them perfect dog in modern times. They are the best apartment dog. Yes, they are docile in temperament. They follow whatever you command them. though sometimes they may command you too. like as in the case of one of my pug owner in my clinic, he may ask you to open your fridge and give him chicken or favorite food. They are charming looking, but that is your mindset. Some consider them as monkey dog and some pet owners like them to see as human looking resembling some cartoon character. Though they are small and yet they are clever. They understand what you say, many pug owners say they can understand your feeling. If you teach them anything 5 times, they will learn to do it. Pugs are social to other pets (unlike Beagle) and also to human. If you take them to social gatherings such as in the supermarket, they don't create mischief, they interact with surrounding people very well. They are playful naturally when they are young. In fact, pugs are active dogs. The writer has seen many old pugs 10 years or above playing like a child provided, there is some human companion playing with them. Face yes, the flat face is a problem, They have the short snout, This is why the British Veterinary Association have asked not to breed pugs. They suffer from breathing problem all through the winter. Since their eyes are protruded, their eyes are hurt easily. They suffer from cataract easily. Great family dog. Friendly with children, and very happy in the presence of other people. You can easily travel with a pug on vacations (by car, not by plane). Great apartment dog. Although a pug will spend time outdoors, as well, they don't need a lot of physical activity or space (unlike huskies, for example), so they will feel just fine in small apartments or houses. Great and funny personality. The word "pugnacious" probably comes from "pug", and explains its personal best. Many people think pugs are stupid, but I think they are just obstinate and bold. They will confront dogs which are 10 times bigger without blinking, but without being aggressive, either. They can be a good therapist for people who live alone or feel sad. A pug will offer comfort, and will always be there to support you. They will cuddle next to you on the sofa, and never abandon you. Pugs shed a lot. They have a double-layered coat, which means they constantly shed their fur, unlike other dog breeds, which shed only twice per year. Don't be fooled by their short hair. They don't deal very well with heat (even moderate heat). 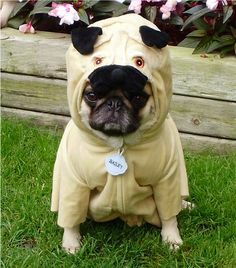 If you live in a hot region, don't buy a pug (or make sure you keep him in the shade and walk them when the temperature is lower). Otherwise, they can even suffer a heat stroke. Related to the above point, they can overheat from too much physical exercise, so make sure you don't push them too much. They need to be in good shape, but this doesn't mean jogging for 10 miles, but more like playing with a ball for 10-15 minutes a couple of times per day. Pugs can be very needy and clingy. Expect your pug to follow you around the house all the time, everywhere! Also, expect them to lick you a lot. They will be depressed if you don't spend enough time with them. Don't get a pug if you work a lot or travel a lot, and you cannot bring it with you. 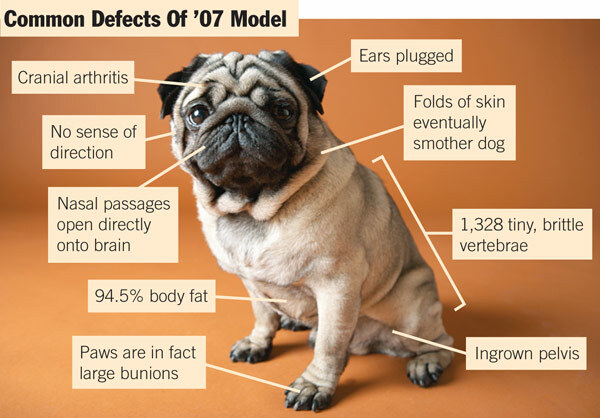 Pugs are more prone to specific diseases: cataract or eye infections (because of their bulging eyes), Demodex (a skin infection), ear infections, and respiratory problems. If you are really thinking of getting a pug, please be prepared a monthly sum for buying pug specific food. Both Royal Canin and Drools have pug specific food.